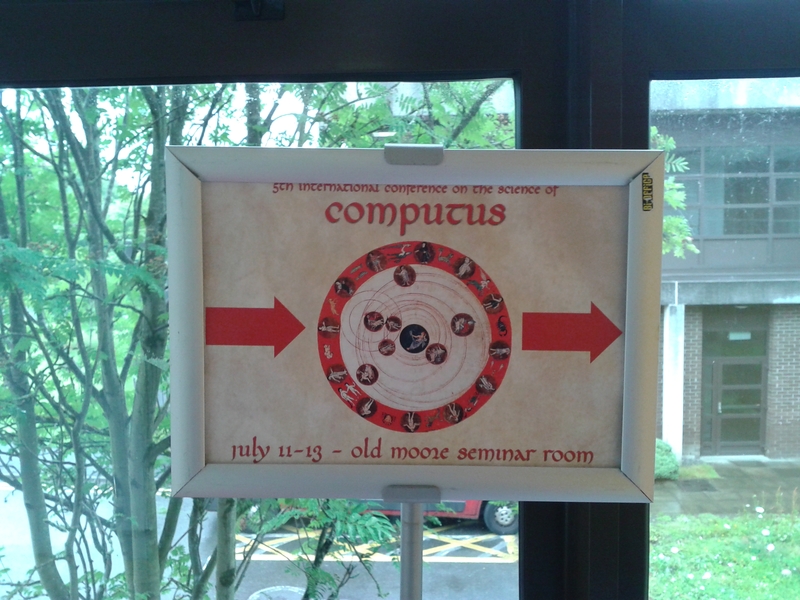 For the last three days, I have been attending the 5th Conference on the Science of Computus which was held at the National University of Ireland at Galway and was organized by Dáibhí Ó Cróinín and Immo Warntjes. It was a pure pleasure to join the computus family and meet in person all these fabulous scholars whose work I have read and deeply admired ever since I got into the field of research on chronology and calendars. Apart from the fact that the conference gathered a fantastic line-up of speakers, it served also as an occasion to launch two meticulous critical editions of primary sources which are of great importance to all historians of science who are interested in the evolution of the debate about the reckoning of time during the Middle Ages. The first book in question is Philipp Nothaft‘s edition and translation of six (actually seven) medieval Christian texts dedicated to the explanation of the mechanisms of Jewish calendar and Alfred Lohr’s critical edition and translation of the eleventh-century Computus Gerlandi. The computistical bookshelf is growing really fast and we should also expect further volumes documenting the proceedings of previous editions of the Computus Conference. I hope that nothing will disturb the computations and the scholars working in the field of medieval computistics will gather at Galway in the early summer of 2016. Meanwhile, explicit co[m]putus anno D[omi]ni mmxiv. P.S.1. I wish to thank Dáibhí and Immo for inviting me to this conference and giving me the opportunity to share my research with this great audience, although the subject of my paper does not fit into the traditional timeframe of the conference (unless one decides that the Middle Ages ended up somewhere at the end of 17th c. …). P.S.2. As for the details about my contribution to the conference, I have already made a promise that I will write a post about the late seventeenth-century MS of computus and I am going to keep it. The readers of Chronologia Universalis should expect this post within the next few days. This entry was posted in Uncategorized and tagged Alfred Lohr, calendars, chronology, computistics, computus, critical edition, Dáibhí Ó Cróinín, Easter controversy, Galway, history of astronomy, history of science and scholarship, Immo Warntjes, International Conference on the Science of Computus, manuscripts, Philipp Nothaft by Michal Choptiany. Bookmark the permalink.